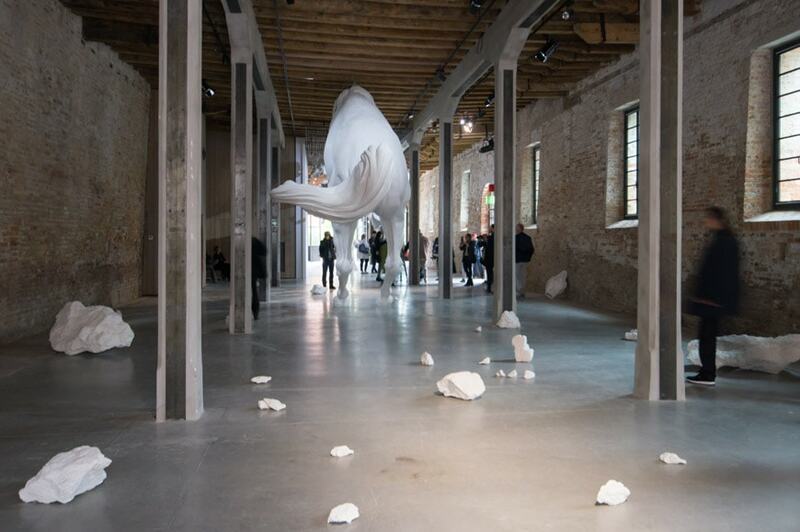 The statue of a monumental white horse, whose movement is frozen in time and space, dominates the Argentinian pavilion at the 57th Venice Art Biennale. 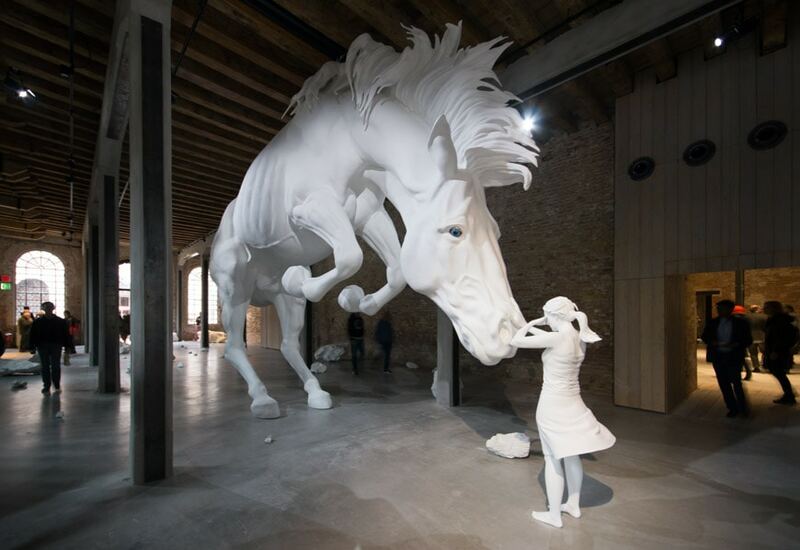 The sculpture is the centerpiece of the work The Horse Problem by Claudia Fontes (b. 1964, Buenos Aires), a special commission for the exhibition in the pavilion of Argentina, curated by Andrés Duprat. 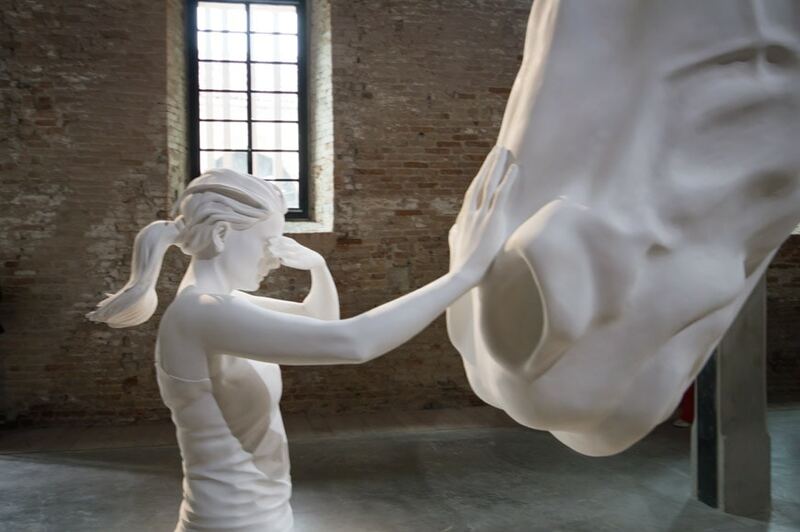 The sculptural group also comprises various other elements: a ponytailed girl touching the horse’s muzzle, a squatted boy, and various pieces of rock; all made in candid white marble dust filled resin. Overall, the prancing horse is used in the work as a symbol of many different things and concepts. On one side, it recalls the equestrian monuments which populate many Argentine and Latin American cities. On another, it represents the clash between nature and industrialization, and the exploitation of natural resources – including the use of animals as a workforce. Finally, it symbolizes the very concept of nation, as a subtle critic to the format of the Biennale itself which, established in the 19th century, is still today based on the idea of national participation to a “universal” art exhibition, something which Fontes considers obsolete and plainly disapproves. Moreover, there is the role of the horse as a sort of unofficial national symbol of Argentina; indeed, the work openly refers to the 1892 painting The return of the Indian raid by Argentinian artist Ángel Della Valle in which, exactly as in The Horse Problem, a white horse and a captive woman are depicted. Fontes considers Della Valle’s painting as an example of apologetic art conceived to celebrate the birth of Argentina as a nation as “the violent takeover by the State of lands inhabited by indigenous populations in the 19th Century”. Frankly speaking, I find the conceptual background of The Horse Problem a bit obscure, which is probably my fault. 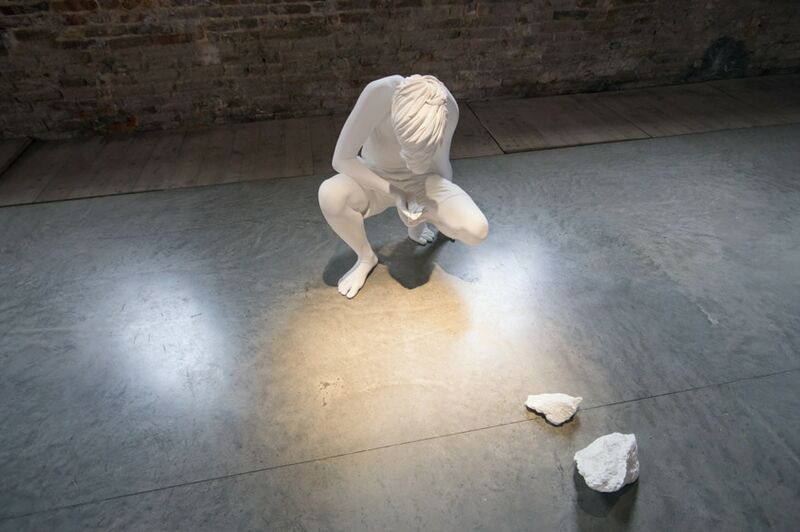 Yet, the monumental composition conceived by Fontes is of a great visual appeal and the dynamic, precarious balance of its figures is truly powerful. The horse is out of scale (namely, larger than real ones) thus creating an estranging and fascinating effect which, similarly to some of Ron Mueck’s sculptures, makes this work at the same time realistic and absurd.